I am so excited to post this Venice-themed Save-the-date film. When I first sat down with Michelle and Chris to plan their Stop-motion film, they had two concept ideas: Venice and old, silent movies. I was flooded with images from my last trip to Venice…canals, gondoliers, bridges, gelato and feeding the pigeons in San Marco square. While I designed the set and planned the choreography, these two brought all of the sparkle and personality to the shoot. Aren’t they adorable? I wish them all the best on their Venetian-themed wedding next summer! Huge thanks to my amazing assistant (with hat flying capabilities), Maddie Wilton-Clark. Want to see another? Check out Katie & Chris’ stop motion save-the-date. Frocks & Rewind – They’re open! In recent weeks, I’ve been featuring local businesses affected by the flooding. You’ll remember these posts on Frocks and on Rewind Consignment Clothing that are both located in the historic Bell Block. Since they were featured, both of these businesses had to relocate temporarily while the building is being repaired. Sora and Krista put their heads together and relocated to a joint Pop-up Location at 1412 1 Street SW. Spread the word everyone, these ladies are open for business! Visit the Frocks Modern Brides | Bridesmaids website and watch for updates. Visit the Rewind site for the latest news. Ever since I did this bridal shoot with the cherry trees in full bloom, I’ve been wanting to create a piece that combined a portrait of the lovely Samantha, with the exquisite cherry branches. I’m so pleased with how this turned out. It would make a stunning canvas art piece. T: Tell us how your business was affected by the flooding? T: When did your shop re-open? T: What’s the #1 thing you want your customers to know? You heard it. Inglewood is open. Let’s spread the word about Savour & their neighbours. Catch the last article featuring Rewind ladies consignment. 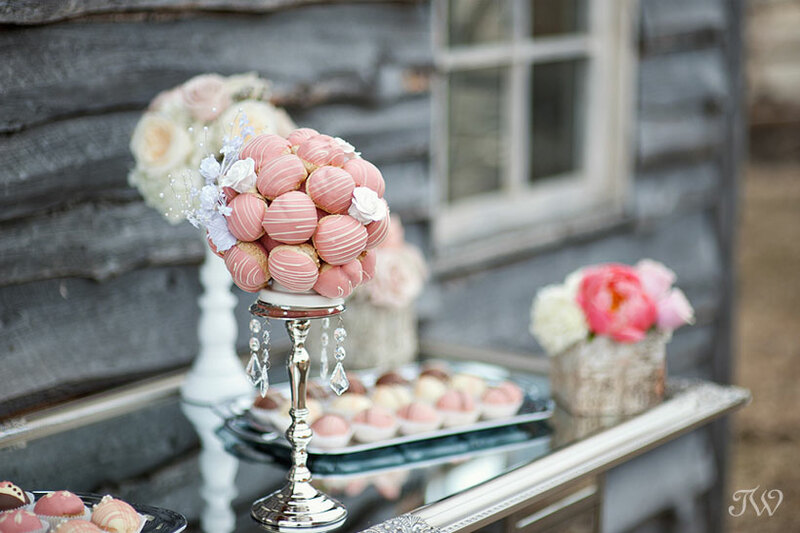 I was introduced to Cruffs House of Cream Puffs when I shot this wedding dessert table for the latest edition of Calgary Bridal Guide. I’m still trying to decide if they are decadent desserts or beautiful works of art? Hmmm? 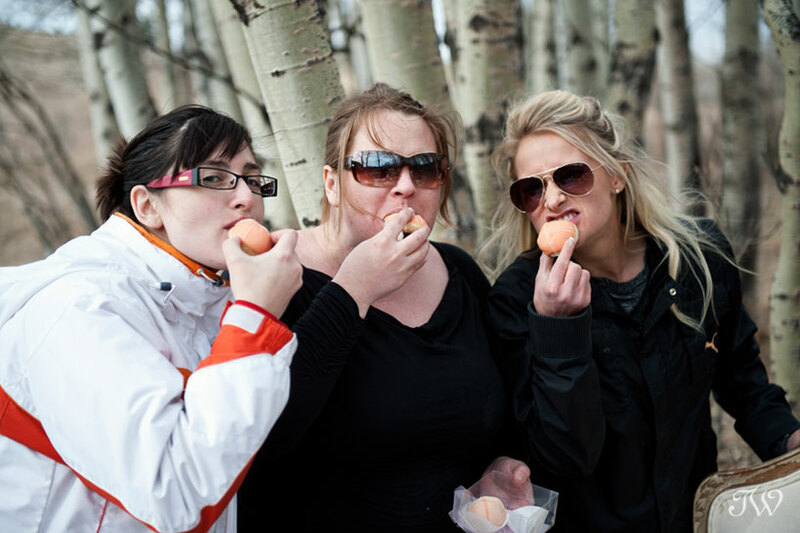 The team tastes the fruit of their labour! Did you see Part One of this photo shoot? 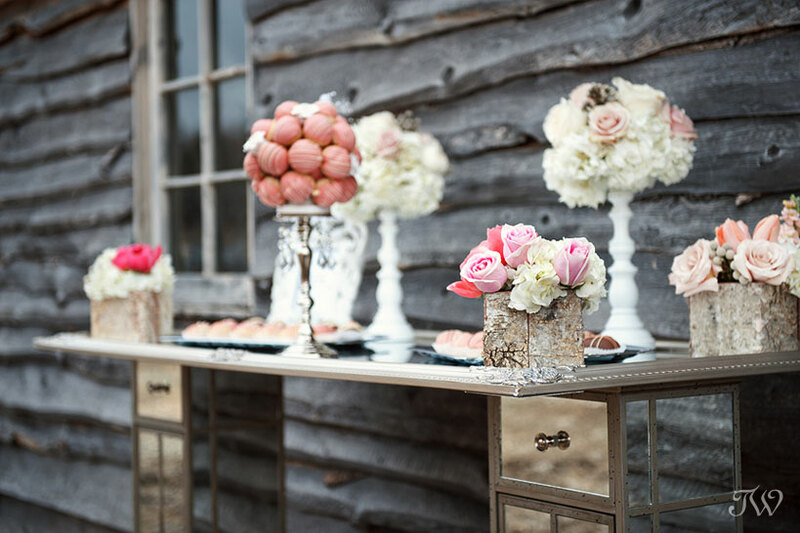 Rentals: Nikki from Grand Weddings Inc, Grace from Special Event Rentals and Mountain Bride’s own decor. 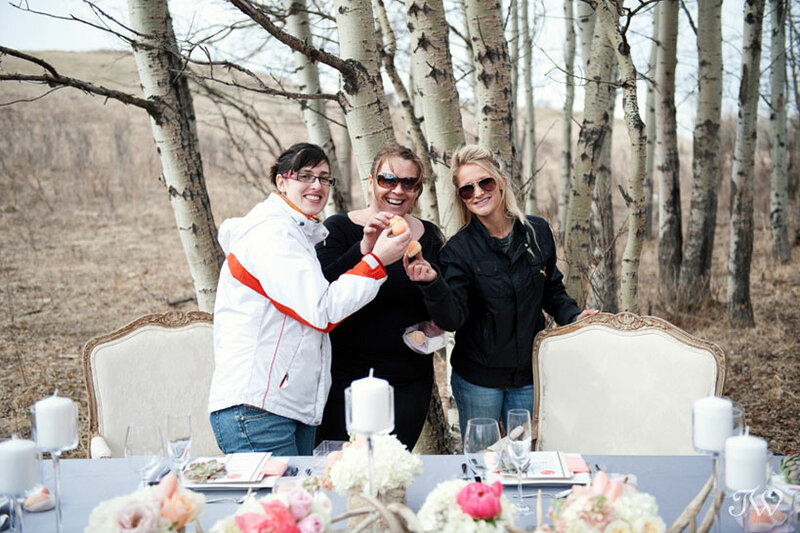 Several months ago, I was approached by Lisa Grosso of Mountain Bride, to shoot Calgary wedding pictures of a design feature for the new Calgary Bridal Guide. Lisa selected an outdoor setting in a poplar grove. It was early spring and although there weren’t any leaves, the flowers and details popped against the sparse backdrop. 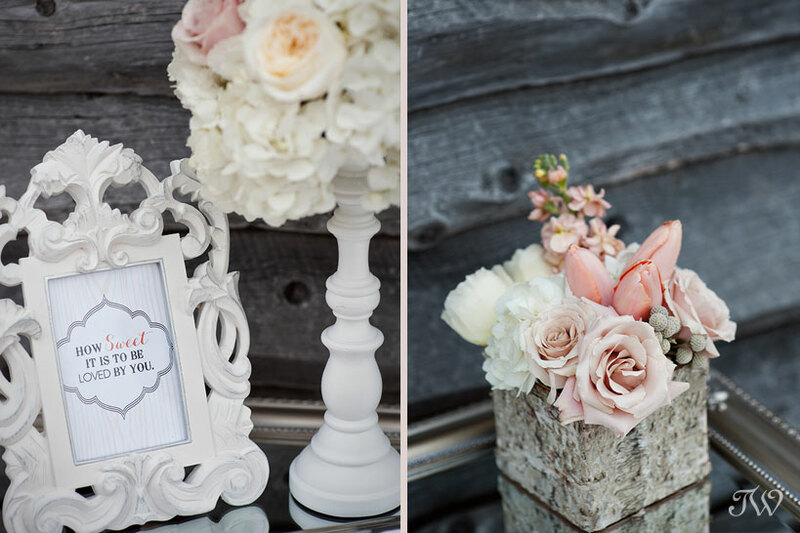 Janelle from Flowers by Janie provided textured and delicate blooms in shades ranging from ivory to fuchsia. 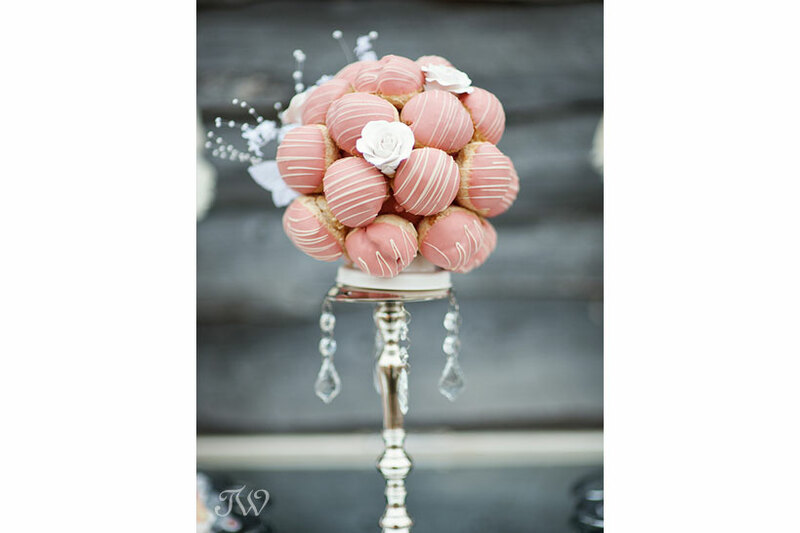 Mario from Cruffs House of Cream Puffs created the most decadent and pretty cream puffs to be used as wedding favours. It was the perfect blend of rusticity and elegance. Feast your eyes! Copies of the new Calgary Bridal Guide are available on news stands now. Get your copy.